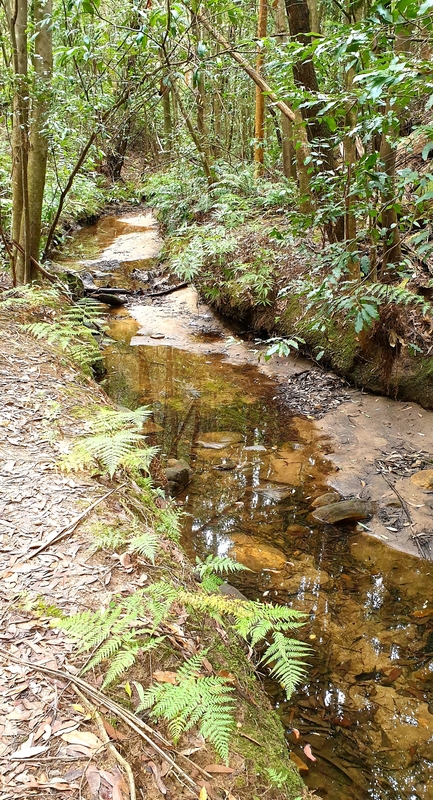 An interesting short circular walk alongside Springwood Creek. 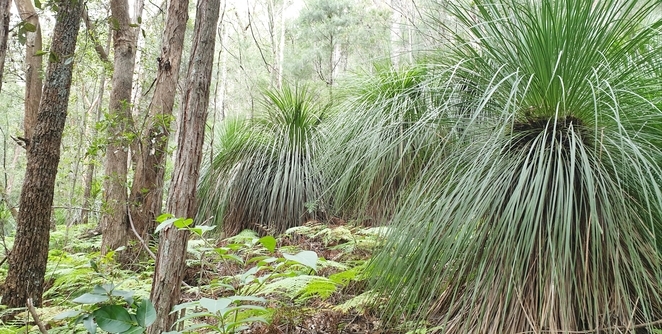 Birdwood Gully Walk takes you from the residential roadside down into a peaceful fern filled gully. The medium graded walk will take one hour to ninety minutes for the 2.6km and can be accessed from Bednall Road, Boland Avenue and Lucinda Avenue on the northern side of the Great Western Highway close to Springwood station. If you join the track from the Lucinda Avenue entrance as we did, the track is quite unkempt at the start. The long grass soon gives way to a set of steep sandstone stairs that lead down through stands of eucalypts and various banksia bushes. 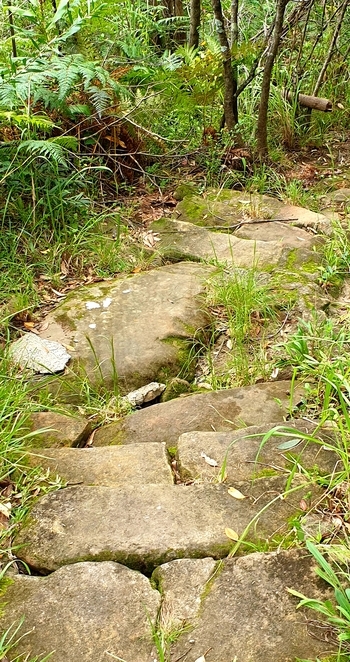 In no time at all, you will be passing beneath sandstone overhangs into a cooler area of greener vegetation, ferns, moss and lichen beside the creek. You may spot a few birds, glowworms and a crayfish or two and you will certainly hear birdsong and see a variety of native flora. The ferny glens of the cool temperate rainforest microclimate were enchanting as were the fern trees and the colourful trunks of the majestic gums. A grove of grass trees appears as you near the Bednall Road entrance where you may hear an occasional car. There are a few signposts along the way as well as manmade bridges, boardwalks and stepping stones. To complete the loop walk it is necessary to walk up Bednall Road for 400m but there is a footpath on one side. 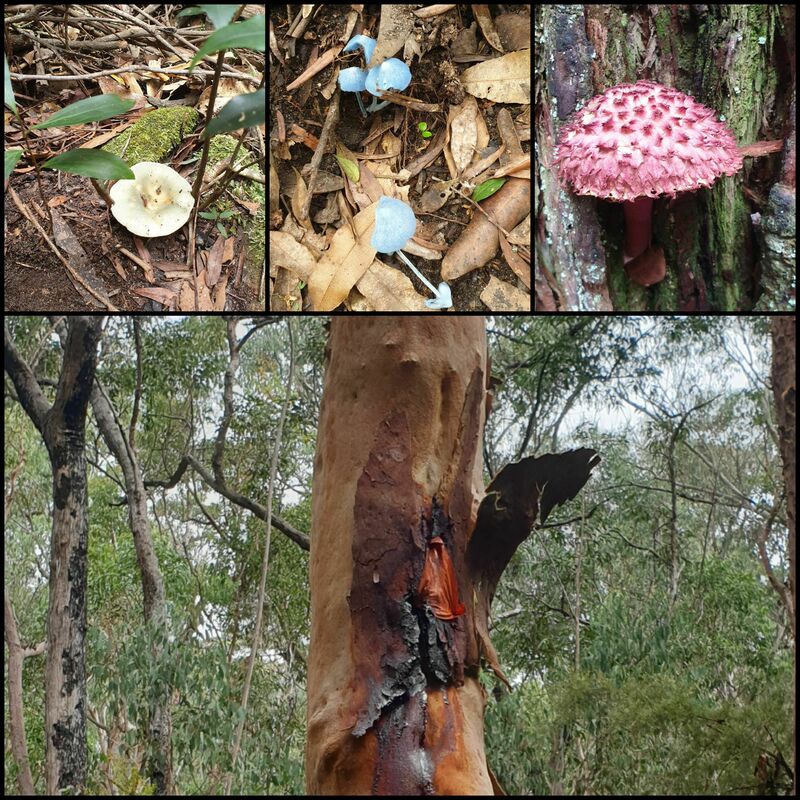 This would be a great introductory bushwalk for young families as it is very pretty with a lot of diversity in a small area and plenty to see if you keep your eyes peeled. Adventurous children would love scrambling over the rocks, playing in the caves and paddling in the creek. Please note there are no toilet facilities or drinking water en route. As with all bushwalks make sure you take water, sunscreen, insect repellent, snacks and your rubbish with you. Take a walk in a gully full of natural beauty. Looks like a fun frolic! Great article and photos Janelle. Love the fungi.